Hello - this is my first walk report - I've used WH for a few years, mainly for research. Late last year, I had come to the alarming realisation that I hadn't completed any hillwalks in 2016 at all! So this year, I've been using every possible opportunity to get out, and to start pushing the boundaries of what I thought I was previously capable. Sitting in the office at work on the Thursday, I was having second thoughts - the temperature outside was in the high twenties (far higher than might have otherwise been expected) and the MWIS forecast was suggesting that there would be no cloud cover - any hillwalk is tough in those conditions. I was planning on heading up to Glen Sheil to have a look at the horseshoe of five just north of Loch Cluanie. Normally these are tackled as a group of three, and a separate group of two - though the WH book does make brief reference to the five together. However - there was a clear escape plan that if I felt that doing the full five was too much of a risk, I could abort after the initial three and head directly back to the car keeping the final two for another day. 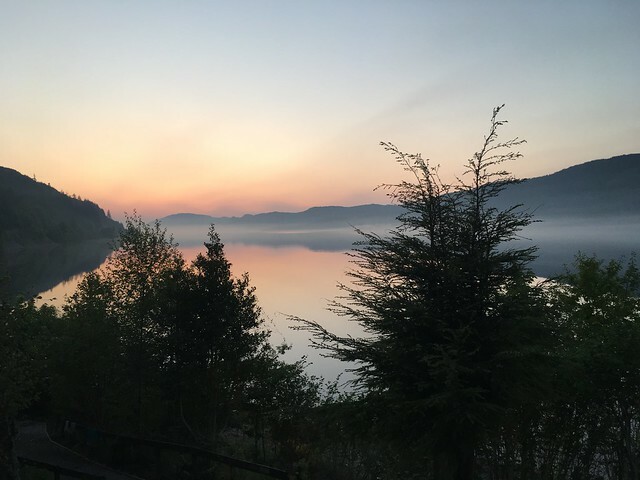 I drove up to the Lochside Hostel near Invermoriston, arriving quite late that evening. I had decided for a very early start, to ensure that I could make the initial ascent up Carn Ghlusaid well before the sun started to heat up, so I set my alarm for 0500h. As it happened I awoke just before sunrise at about 04:30, and decided to head off at that point. The view across Loch Ness was beautiful, with a slight mist over the water, and the sun just behind the hills. From Invermorriston, it is only a short drive along Glenmoriston to the Lundie carpark on the banks of Loch Cluanie, where I fired up the stove and had a hearty breakfast whilst feeding the midges. Once fed and booted up, I was able to start walking at 05:30, starting the climb up Carn Ghlusaid. The path up Carn Ghlusaid is excellent, and progress rapid - reaching the summit at 07:00. On the approach to the summit a large lone deer walks out onto the horizon about 20m in front of me, before stopping, staring indignantly in a "get off my mountain" kind of way - clearly suprised to see anyone up there at such an early hour. 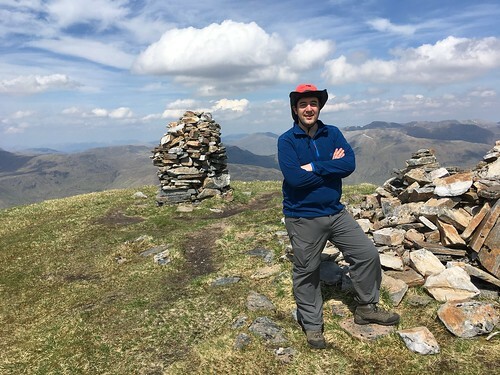 The final climb up the rocky, pointy second summit (Sgurr nan Conbhairean) at 1109m felt a touch harder, but arrived quickly as I summited at 08:00. By this time, the haze was starting to clear, but there was still a useful amount of cloud cover, and of course, the sun was still very low in the sky - so it was still very cool. 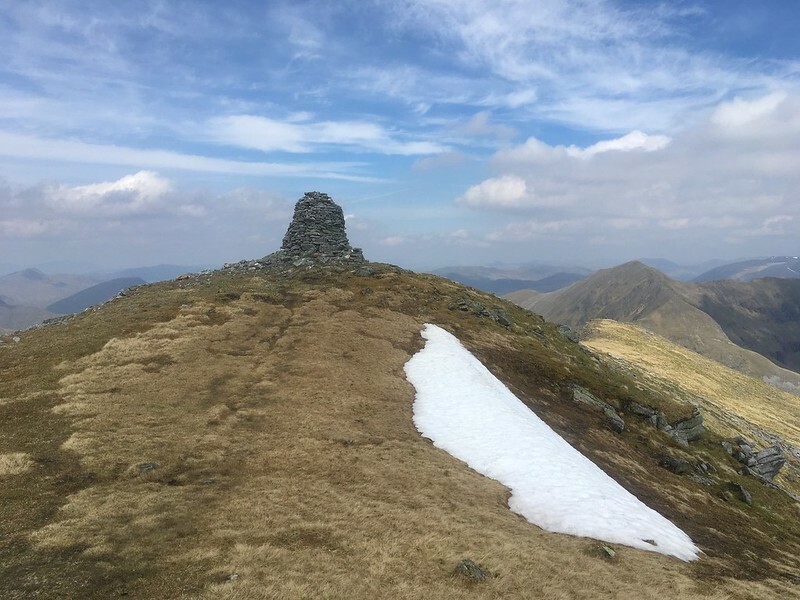 The onward route takes the path directly north to the third summit with a drop down to 910m, before climbing back to the summit of Sail Chaorainn at 1002m at 09:00. Sitting for a while to admire the scenery - the early morning haze is starting to lift, and blue skies are starting to appear. I'm tempted to pop along to the top of Carn na Coire Mheadhoin, but decide to conserve energy - I might need it later. 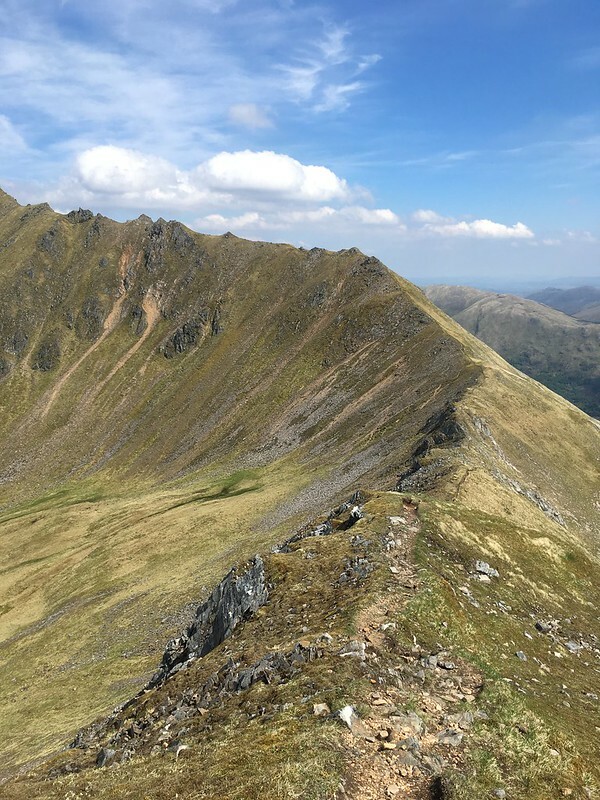 From here - the route reverses, and only misses the second summit by a faint bypass path to the west at 1060m, meaning that reascent almost to the top of the Sgurr and Conbhairean is necessary. Stopping for a break on the ridge high above the Gorm Lochan at about 1100h, it is decision time. Do I start the descent back down to the car, or do I press on to catch the two hills further to the West? The temperature is still reasonable, and there is a fine breeze. 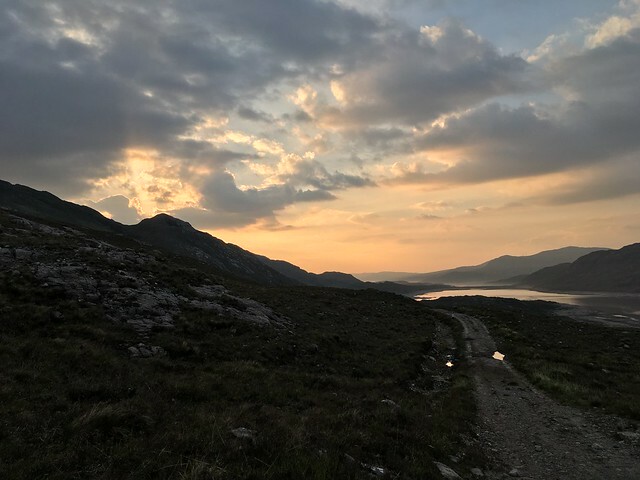 I'm also feeling alright: I get the feeling that if I were to get back to the car, I would have had the nagging doubt that I would have managed all five, and so it was - descision made - the downclimb into the Bealach Choire a'Chait (@730m) wasn't particularly tricky, but was bouldery, steep and remote so I took my time. I was fully expecting to find some runing water somewhere here, to top up my supply, but aside from some boggy puddles that I wasn't happy with, I couldn't find anything suitable (I was carrying both tablets and a filter, so if it were critical - I'm sure I could have made something work), but in any case, it was clear that I wasn't going to be guaranteed a good refill until the descent of the fifth hill, so had to start rationing what was left of my two litre water bladder. The ascent up to A'Chralaig was tough - in places a sharp wind had picked up (which was pleasantly cooling), but the temperature was clearly starting to rise also, whilst my energy levels were dropping. I stopped frequently to catch my breath, and to snack on anything that might help keep energy levels up (whilst cursing myself for accidentally leaving a bag of toffees in the car ). Gaining the ridge at about 1000m was a cause of celebration, as the gradient levels out, and the large well-made cairn comes into view. It was about 13:00 at this point, so it was a tough three-hour traverse to get from summit #3 to summit #4. As I sat just beyond the cairn at 1120m admiring the scenery and the ridge ahead, two other walkers appeared, Gary and John from Dunkeld/Blairgowrie, who were tackling the western two of my circuit. The three of us would spend much of the rest of the walk together, exchanging experiences and stories. If you read this - thanks for your company fellas, it was an absolute pleasure. It was around this point that I stopped to apply SPF30 suncream for the first time that day. The sun was high overhead, and I could feel it strong on my skin - the forecast was reporting 30degC in the glens - I had deliberately worn long trouser legs and long sleeves on that day to minimise exposure, but I wasn't to take chances in this heat. 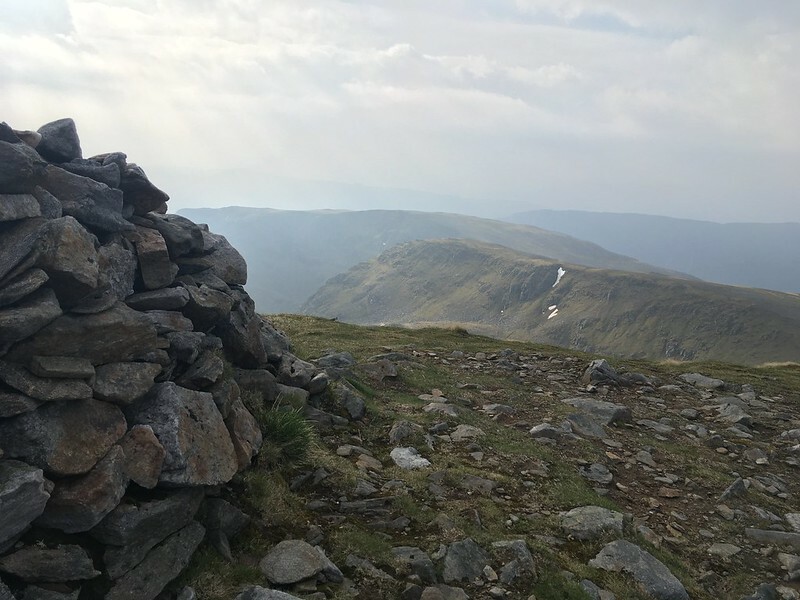 After sitting in the sun on the summit with John and Gary, we started the descent, having previously easily found the path down into Coire Odhar marked by a small navigation cairn. Soon after the loose scree path, there was a clear running stream, allowing me to take on a full two litres of cool water. As it was soo clear and so high, I didn't bother with the filter, but dropped a couple of tablets into the water. It was a marvellous feeling to be able to start drinking cool water, without worrying about rationing consumption. We continues the grassy descent into the glen, before picking up the landrover track, stopping only for a bit of banter with a digger driver who was out improving the drainage of the track and a cheerful swiss tourist who was out on a monster hike from Braemar, and heading in the direction of Glen Affric. After a cold drink at the Cluanie, John and Gary helped me out with a lift back to Lundie where my car was parked, whereupon I started the long drive home, arriving back at Linlithgow just shortly after 21:00. After using WH for so long to research routes, I hope some part of this route description might help someone do a similar journey in the future. "Where next?" will be my next question. I'm not sure yet, but I've definately got unfinished business on the south side of Glen Sheil. A big day indeed! Excellent pictures, nicely described. Looking forward to future reports, which will no doubt also make me feel like a lazy git, as we rarely do half as much as you did then! You didn't mention having to scale the fence yesterday at the start. Annoyed me a bit as the "walkers gate" also had a chain and padlock on it!! I did the set of 3 yesterday. started at 8 and had to have a 10 minute break at 9. Sweltering. Good route and good view over to loch affric from the other wee top after sail chaorainn. Coop wrote: You didn't mention having to scale the fence yesterday at the start. Annoyed me a bit as the "walkers gate" also had a chain and padlock on it!! Ah - that's because I didn't! I recall being surprised at that walkers gate, because it looked like it was fully secured, but on closer inspection, there was a spring loaded latch on the chain, allowing it to be opened. I was all for getting onto whoever owns the land / transmitter.